The Carlock Mennonite Church (Mennonite Church USA) was established because a number of families belonging to the North Danvers Mennonite Church had moved to town and found it inconvenient to attend services in the country. The Ladies' Aid was organized as a branch of the North Danvers Ladies' Aid in April 1912. 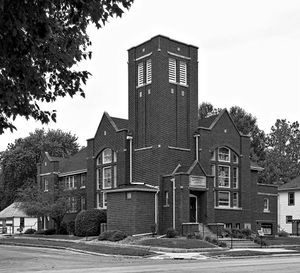 The organization of a prayer-meeting circle and a Christian Endeavor Society held conjointly with meetings of the United Presbyterian Church finally resulted in the organization of a Mennonite congregation on 14 April 1914. For a while services were held in the town hall, but in January 1916 a new church was dedicated. In 1952 the church had 159 members; in 2009 there were 65 members. In 2017 Carlock Mennonite Church shifted from the Central District Conference to the Illinois Mennonite Conference. Miller, Grace. "Carlock Mennonite Church (Carlock, Illinois, USA)." Global Anabaptist Mennonite Encyclopedia Online. 1953. Web. 25 Apr 2019. http://gameo.org/index.php?title=Carlock_Mennonite_Church_(Carlock,_Illinois,_USA)&oldid=148681. Miller, Grace. (1953). Carlock Mennonite Church (Carlock, Illinois, USA). Global Anabaptist Mennonite Encyclopedia Online. Retrieved 25 April 2019, from http://gameo.org/index.php?title=Carlock_Mennonite_Church_(Carlock,_Illinois,_USA)&oldid=148681.